This week Pride celebrations are happening all across the globe. These celebrations are rooted in the Stonewall riot that took place in the summer of 1969. Pride celebrations have evolved over the years and many believe that it has become more of opportunity for corporations to target “gay consumers” and for the more privileged sectors of the LGBTQ community to minimize the past and current realities of those whom the Stonewall riot owes its legacy, specifically the trans and queer communities of color. The history of the LGBTQ community in Grand Rapids is presented in the 2011 documentary we produced. The film involved interviewing over 70 people, collecting archival material and conducting an analysis of the way in which commercial media reported on this struggle. 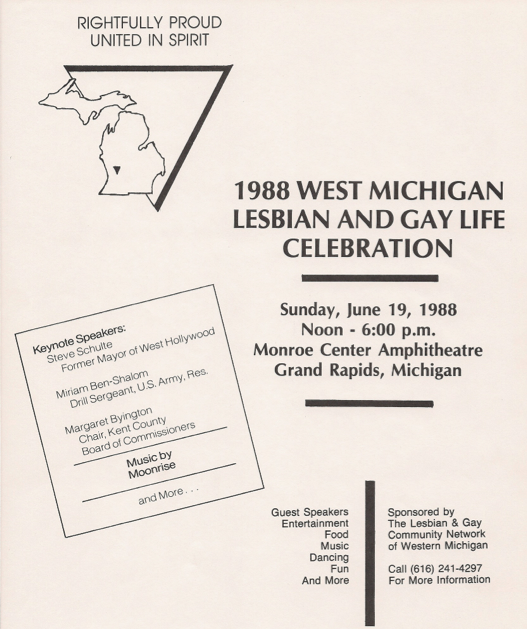 The first Pride Celebration took place in 1988 in downtown Grand Rapids at the Monroe Amphitheater (now Rosa Parks Circle). Someone filmed the event and preserved the historic event, which you can watch below. While the LGBTQ struggle in Grand Rapids was in no way as radical as it was in New York or San Francisco, the struggle has been very real here and it is important to honor the sacrifices that people made to fight against the hyper-religious and homophobic climate that existed and still exists in West Michigan. This entry was posted in LGBTQ Movement and tagged A People's History of the LGBTQ Community in Grand Rapids, homophobic climate in West MI, LGBTQ community in Grand Rapids, Pride Celebration in Grand Rapids. Bookmark the permalink.